As the U.S. Supreme Court prepares to hear a historic challenging to partisan gerrymandering in North Carolina, Love Caesar, an NC A&T student, gives her perspective on the state of gerrymandering and voting rights. 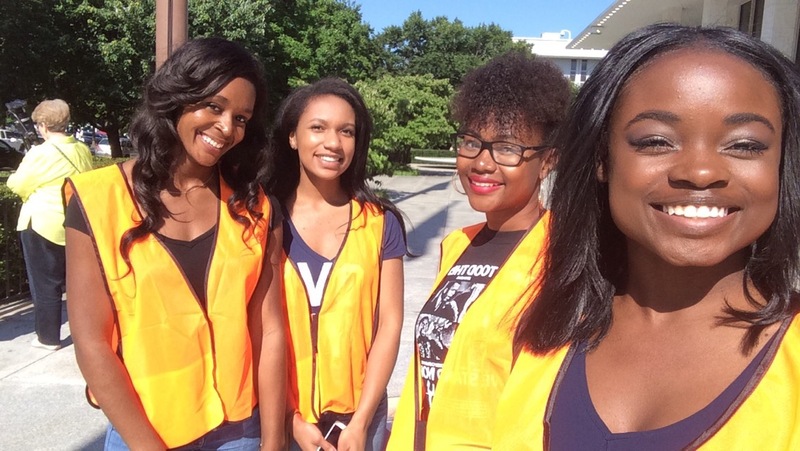 Love Caesar (right), pictured here with her friends and fellow organizers, is a student at NC A&T and a Democracy Fellow at Common Cause North Carolina. As the U.S. Supreme Court prepares to hear Common Cause’s historic case challenging partisan gerrymandering in North Carolina (Rucho v. Common Cause), Common Cause’s Kati Phillips sat down with Love Caesar to talk about how gerrymandering and the attacks on voting rights have played out on the campus of the North Carolina Agricultural and Technical State University (NC A&T), the largest historically Black university in the United States. Love is a student at NC A&T and a Democracy Fellow at Common Cause North Carolina, where she organizes her fellow students to advocate on redistricting reform and other public policy issues that are of vital importance to their community and educational institution. KP: So, can you tell me how you got hooked up with Common Cause NC and became a Democracy Fellow? LC: When I was in high school, my sister was at NC A&T. She was a fellow with Common Cause, and some of my friends and I went with her to marches in Raleigh to protest HB2, otherwise known as the “Hate Bill.” Next year when I was at NC A&T I applied (as a sophomore). This is my second year now. KP: What were you interested in doing as a fellow? LC: I wanted to try my hand at organizing, especially students on campus. After I graduated it could be broader, and maybe try organizing on the city level. KP: Great. And what are some of the issues you have been organizing around this year? LC: I have been organizing a lot on Historically Black Colleges and Universities (HBCU) issues. A couple weeks ago at the “Lobby Day” in Raleigh, we were lobbying for HBCU funding, as well as the gerrymandering going on at A&T campus. Because as you know, the campus is split right down the middle. They divided the campus in two congressional districts, with students on both sides, classrooms on one side and the library on the other. Stuff like that where HBCUs are being exploited and disenfranchised by the the General Assembly in Raleigh. We were talking to them mainly about issues like those, affecting HBCUs. KP: When you talk about that line, with students on both sides, buildings on both sides, how does that disenfranchise A&T students? LC: Well if you look at the population of NC A&T, most of the students are African-American, and we’re in both Congressional District 6 and Congressional District 13. Students at NC A&T are largely liberal thinking or Democratic voters. But if you take the student population and divide them into mainly Republican districts, then you have a population in North Carolina that’s being diluted. It’s a cracked population, and each side gets diluted. So when you vote in any election, it’s going to be diluted into a Republican majority. KP: Right, so both District 6 and District 13 have consistently elected Republicans since the last maps were drawn. KP: How would you characterize the political activism on your campus? LC: I definitely think that over the past few years I have seen an increase in the turnout every election in the time I have been here. My freshman year, there was a big march in front of the Reflection Pool after what happened to those students in Charlotte. After that, a lot of students were more politically aware. So then, when I came back for my sophomore year, that’s when I joined Common Cause. So we went out during the beginning of the year, and we wrote chalk on the ground around campus on the concrete. We wrote messages about gerrymandering, questions like “Do you know what gerrymandering is?” Just to get people aware of what the term is in general, and then later broadening it out to, “Do you know that your campus is badly gerrymandered?” And that it’s a major issue in North Carolina right now, that worked. We also tried to get students into shuttles during early voting as well. We got shuttles that worked around the clock for some hours during the day, for a couple days a week. And I do believe we had good turnout last year. And we did it again last semester so more students could come and join. KP: And the shuttles, just so I understand, were taking people to the polls? LC: Yes, to go to the Greensboro Courthouse, downtown, to the early voting polling place. They would pick them up, take them there, and then the voters would have their time to vote, because the shuttle would just keep going back and forth, to the school and back. LC: Yeah it was a good system, a lot of students did it. KP: Super cool. In terms of your last “Lobby Day”, when you go to the capital and you talk to state legislators about gerrymandering, what is that experience like? LC: We go and talk to them and we basically give them the rundown of the issue that we’re talking about. Then we move on to how it affects us personally or the people around us in our friends and family. And we talk to them and we get them interested in it, so hopefully when we leave they will take the words we told them and act on them or get something in motion where they can take steps to eliminate whatever issue we brought to them. KP: Right. And when you talk about gerrymandering in particular, how that affects you personally or your friends and family, what do you say to them? LC: Well I think that the first election that I could vote in was 2016, and all the elections I have voted in since then have been on maps that are drawn currently. And since they are all gerrymandered, I don’t think that since I have been an eligible voter, I don’t think I have voted in an election where it was on a fair Congressional map, where the lines are not gerrymandered. I can say that for me and many of my peers who are my age – and even some people who are older than me – haven’t voted on the fair map. Gerrymandering such as this – partisan gerrymandering – is unfair for a lot of people, especially for the people who have no hand in the electoral process. And they don’t even know about it. So just that alone is a main reason. KP: That’s really powerful to think about. That every time you have voted, you have done so in a system in which your vote didn’t count. Seems like that could be really discouraging. But it has actually been motivating for you in a different way. LC: Yeah, it definitely gets discouraging sometimes. But when you think about it, we as students have the tools to press for change. I really think that’s the position you have put yourself in. It is important to fight it. KP: So let’s talk about fighting for a little bit. What do you make of the Supreme Court case – Rucho v. Common Cause – that will hear arguments in March? LC: I really have hopes that they will overturn the maps that the state passed. I know there’s a similar case in Maryland, where the districts are being gerrymandered there, but it’s like reverse, because the Democrats are gerrymandering the districts there. So I think the pressure is building up in more than one state and that is something the Supreme Court justices will take into account because there is so much support behind it. KP: And what do you think is the solution? What is the best scenario to come out of the case do you think? LC: I hope that the Supreme Court rules against the gerrymandering. And I think there should be an unbiased district line drawer. I don’t think that one party should have control over where district lines are being drawn, what population size is, what party and race people are that are in the party. We see from the past that if they can gerrymander, we are the ones who will be taken advantage of. So we need a third party who can come in and draw a fair district map. KP: And that third party can be different in different states. But it should be independent and nonpartisan. LC: The Supreme Court needs to say it is unconstitutional, and there needs to be more haste and more demand. There needs to be a point where they put their foot down and really enforce that it is unconstitutional and not linger like this, letting so many states be involved in such an unconstitutional thing. It sets a bad example for the future of the country. KP: And what happens, talking about the future of the country, if the Supreme Court doesn’t say it’s unconstitutional? LC: Voting rights in this country have always come with a sort of give and take. We saw this this year in North Carolina with our new voter ID law, and they want people to show IDs when they go to vote every Election Day. That’s not the case in most states. And some people don’t have that type of thing. And you can’t just go and get an ID if you don’t even have an address. So I just really think that moving forward, this give and take when it comes to voting rights and social justice in general, it really needs to end, and I think that starts with people getting informed about it. If you don’t know about it, you are not going to know what to do about it. You are not gonna even have a thought about it. But as soon as you know about it, moving on, you are going to be asking how you can fix it, how you can help. I definitely think that spreading the word is the key to making sure the future of America is on track. People need to know what is going on. They need to know how to fight what’s happening. And then if the Supreme Court rules in favor of the gerrymandering, and doesn’t strike down the gerrymandering,…if that happens, that’s another thing that I hope will make people more fired up – the blatant unconstitutionality of what is going on. KP: So that will light a fire under folks to organize for voting rights? KP: Is there anything else that you would like to add? LC: I do think that I should emphasize that the issues we are talking about aren’t about Democrat or Republican, it’s about power. And people realized when people get too much power, it kind of corrupts the entire system we have been working on. It starts in the head. And since the government is the main base of the United States, if they’re not enforcing their own rules, then really what do these people have to hope for for themselves based on what the government offers them. Because this isn’t good government, and that’s what we need!